This is an old article that was written before the WSOP 2008. It's main focus was to inform players about which rooms were offering the best satellites. I guess it's still an interesting read, although it's not amazingly useful any more. The WSOP stands for the World Series Of Poker, and is by far the greatest event on the calendar for a poker player. The WSOP is like the superbowl of Poker, where there are a number of tournaments taking place in the period of just over a month. There are a number of different tournaments for the different variants of the game, such as Omaha, Stud, Holdem for all of the structures of Limit, Pot-Limit and No Limit. Although each Main Event winner is immortalized in the history books and receives instant fame, the most famous WSOP winner of recent years is the 2003 champion Chris Moneymaker. Chris Moneymaker's popularity stems from his infamous route to the final table, and is more than likely to be responsible for the 'poker boom' over recent years. Moneymaker was your average accountant that used to enjoy playing online poker in his spare time. Moneymaker managed to win a $39 WSOP satellite on PokerStars, earning him a seat to the $10,000 buy-in 2003 Main Event. The funny thing is that Moneymaker had never played live poker before taking his seat in the tournament, as he had only ever played online. Despite this, Moneymaker went on to make it to the final table, and picked up the $2,500,000 first prize after eliminating Sam Farha. This story sparked a lot of interest for those new to online poker and the WSOP, as it highlighted how it is possible to go from working a standard 9 to 5 job one day, to a millionaire poker player the next. The presence of online poker satellite tournaments means that you no longer have to fork out $10,000 to make it to the Main Event; you can instead use your skill at the tables to win your entry to the tournament. The following year, the Main Event was won by another online satellite qualifier Greg Raymer. How to qualify for the WSOP online. WSOP 2008 qualifiers are of course no longer running I'm afraid! Just a quick heads-up there for you. As already mentioned, you are able to qualify for the World Series 2008 via one of the numerous satellite tournaments that are taking place across many different poker rooms every day. The great thing about these satellites is that they are widely varied, giving even the lowest limit players the opportunity to qualify with satellite tournaments sometimes starting at $1.50. Of course, the lower the initial buy-in, the more difficult it is going to be for you to qualify, as you will be competing against a far bigger field of players. However, at the end of the day someone has got to qualify, so there's no reason why it couldn't be someone starting out at the $1.50 MTT satellites. But for those with the bigger wallets, you can increase your chances of qualifying with the higher buy-in satellites that are also on offer across many of the different poker rooms. Although many rooms offer satellites for the 2008 WSOP, some are obviously going to be much better than others. So if you're looking to make your way into the 2008 WSOP Main Event, you should try out the satellites at the following rooms. Bodog runs a very well organized set of satellites that gives every player the opportunity to win their way into the WSOP. Each player that qualifies will win a package that is worth $12,000, as well as receiving a personal handler to make sure you play your best for the tournament. PokerStars is the original home of the WSOP Main Event satellite. PokerStars has been running satellites for a very long time now, so they know what types of tournaments work best for the players. There are many many ways to make it to the main qualifiers, through the MTTs, STTs and turbo tournaments on offer. With Full Tilt being one of the biggest online poker rooms, it is almost obligatory for them to run a decent number of good satellites for the WSOP Main Event. Although Full Tilt do not offer the greatest range of tournament buy-ins, there are many different qualifiers on offer for you to make it to the main event. 1] Play for the win. So many MTT players aim to just hang on and crawl into the winning positions, but this is not the best approach for a satellite. Always aim for the win, and play your standard game without the letting the bubble scare you. You stand a much better chance of winning if you aim for the top, rather than to just hang on. 2] Put the prize at the back of your mind. If you keep thinking about what you could win, you are going to dramatically effect the way you play. If you just play to the best of your ability, and forget about the prize at stake, you stand a much better chance of getting to the top. 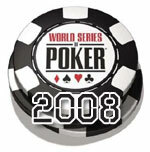 So there's a quick 101 on the WSOP 2008. Satellites are running throughout May and June, so there's more than enough time to take part in some qualifiers for your chance to play at the No Limit Texas Holdem Main Event. The best part about the satellites is that you can qualify for as little as $1, so it's really open to all different players, no matter how big your bankroll might be. Just be sure to give me a shout at greg[at]thepokerbank[dot]com if you manage to qualify, and I'll write up a nice profile about you on the site.